MIR-22-341-040 Mirka Basecut 6in PSA Discs 40 grit. 50 Disc per box. MIR-18-111-447 MIRKA 6in X 9in Maroon Very Fine Scuff Pads 20 Pads per box. MIR-18-241-447 MIRKA 6in MIRLON SCUFF DISC Maroon. Very Fine 10 per pack. MIR-18-241-448 MIRKA 6in MIRLON SCUFF DISC Gray. Ultra Fine 10 per pack. MIR-18-573-373 MIRKA Mirlon Scuff Roll Very Fine Maroon. 4-1/2in X 10yd Roll. MIR-18-573-447 MIRKA Mirlon Scuff Roll Very Fine Maroon. 4in X 10yd Roll. MIR-18-573-448 MIRKA Mirlon Scuff Roll Ultra Fine Gray. 4in X 10yd Roll. MIR-18-573-943 MIRKA Mirlon Scuff Roll Ultra Fine Gray. 4-1/2in X 10yd Roll. MIR-21-104-P1000 MIRKA 9in X 11in Waterproof P1000 grit Finishing Sheets. 50 Sheets Per Pack. MIR-21-104-P1200 MIRKA 9in X 11in Waterproof P1200 grit Finishing Sheets. 50 Sheets Per Pack. MIR-21-104-P1500 MIRKA 9in X 11in Waterproof P1500 grit Finishing Sheets. 50 Sheets Per Pack. MIR-21-104-P180 MIRKA 9in X 11in Waterproof P180 grit Finishing Sheets. 50 Sheets Per Pack. MIR-21-104-P2000 MIRKA 9in X 11in Waterproof P2000 grit Finishing Sheets. 50 Sheets Per Pack. MIR-21-104-P220 MIRKA 9in X 11in Waterproof P220 grit Finishing Sheets. 50 Sheets Per Pack. MIR-21-104-P320 MIRKA 9in X 11in Waterproof P320 grit Finishing Sheets. 50 Sheets Per Pack. MIR-21-104-P360 MIRKA 9in X 11in Waterproof P360 grit Finishing Sheets. 50 Sheets Per Pack. MIR-21-104-P400 MIRKA 9in X 11in Waterproof P400 grit Finishing Sheets. 50 Sheets Per Pack. 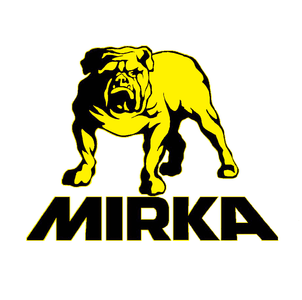 MIR-21-104-P500 MIRKA 9in X 11in Waterproof P500 grit Finishing Sheets. 50 Sheets Per Pack. MIR-21-104-P600 MIRKA 9in X 11in Waterproof P600 grit Finishing Sheets. 50 Sheets Per Pack. MIR-21-104-P80 MIRKA 9in X 11in Waterproof P80 grit Finishing Sheets. 25 Sheets Per Pack. MIR-21-104-P800 MIRKA 9in X 11in Waterproof P800 grit Finishing Sheets. 50 Sheets Per Pack. MIR-21-118-P1000 MIRKA 5-1/2in X 9in Waterproof P1000 grit Finishing Half Sheets. 50 Sheets Per Pack. MIR-21-118-P1200 MIRKA 5-1/2in X 9in Waterproof P1200 grit Finishing Half Sheets. 50 Sheets Per Pack. MIR-21-118-P1500 MIRKA 5-1/2in X 9in Waterproof P1500 grit Finishing Half Sheets. 50 Sheets Per Pack. MIR-21-118-P2000 MIRKA 5-1/2in X 9in Waterproof P2000 grit Finishing Half Sheets. 50 Sheets Per Pack. MIR-22-342-080 MIRKA Basecut 6in 80 grit PSA Discs. 100 Disc per roll. MIR-22-352-040 Mirka Basecut 8in PSA Discs 40 grit. 25 Disc per box. MIR-22-352-080 Mirka Basecut 8in PSA Discs 80 grit. 25 Disc per box. MIR-22-364-040 MIRKA Basecut 2-3/4 X 16-1/2 PSA File 40 grit. 25 Sheets per box. MIR-23-170-036 MIRKA Gold Clip On 36 grit File Sheets 2-3/4 X 17-1/2. 50 Sheets per box. MIR-23-341-036 MIRKA GOLD Heavy Duty PSA 6in 36 grit E Weight Discs. 50 Discs per box. MIR-23-342-080 MIRKA Gold 6 in PSA 80 grit DA Discs. 100 Disc per roll.